New Zealand has some of the highest densities of German and common wasps in the world. They have major social and environmental impacts. New Zealand has several kinds of native wasps which have evolved here and have never become a nuisance. In recent years there have been four social species accidentally introduced which are classed as pests. Social wasps live as colonies in nests of honeycomb-like cells. They form complex social groups and all members of a colony help raise the young. There are many ways you can help us reduce wasp numbers, like destroying nests or using wasp bait. These wasps are very similar in appearance, and both have the characteristic black and yellow colouration. The German wasp was introduced in the 1940s and the common wasp arrived relatively recently but is now widespread. Both species live in large colonies, about the size of a soccer ball. These colonies can become huge if they manage to survive over winter. German wasp nests are grey. Common wasp nests are brown. The world's largest recorded wasp nest was discovered at Waimauku (near Auckland). It was 3.75 metres tall and 1.7 metres wide. Landcare Research guide to German and common wasp identification (external site). New Zealand has some of the highest densities of German and common wasps in the world. This is because they have no natural predators here, our winters are mild and there is plenty of food for them. Wasps are a nuisance to forestry gangs, and a worry to tourist operators. They are unwelcome guests at summer picnics and barbecues. No-one finds a wasp sting a fun experience. 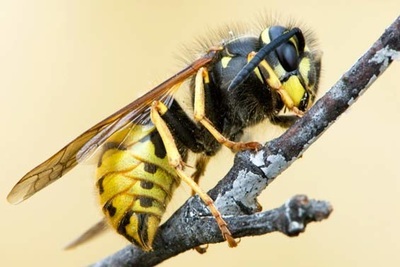 The venom from a wasp sting contains several toxins that can cause a hypersensitive or allergic reaction in some people. Landcare Research (external site) provide detailed first aid advice. In some beech forests there are an estimated 12 nests, or 10,000 worker wasps, per hectare. This makes the numbers of wasps in these areas higher than that of all native birds, stoats and rodents, put together. Landcare Research (external site) provide further information on the impacts of these wasps. This study assessed the economic impact of German wasps and common wasps across industries, society and the natural environment in New Zealand. Although not as much of a problem as German and common wasps, paper wasps have also been introduced to New Zealand. 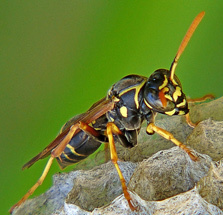 The Asian paper wasp has been found in the North Island and top of the South Island. The Australian paper wasp remains confined to the north of the North Island. Both paper wasps build small nests out of regurgitated woody material, about the size of a pear. The best way to reduce a local wasp population is to find and destroy all the nests in the area. Usually wasps fly no further than 200 metres, so you should aim to kill all the nests within this range. The Landcare Research website (external site) contains further information about controlling these wasps. If you search on sunny days, near dawn or dusk, the low light angles will highlight the flight path as wasps enter and leave the nest. Place a dessert spoonful of insecticide at the nest entrance after dark when the wasps have stopped flying. You can use a puffer bottle for this job. 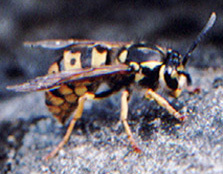 Worker wasps flying in and out will spread the powder into the nest and the colony usually dies within a day. If activity continues repeat the treatment until wasp activity ceases. Don't shine your torch into the nest or wasps will fly up the beam. There are a range of insecticides available from hardware and garden stores. These include Wasp Killer Dust and Permex Insect Dust, which have permethrin as the active ingredient, and Rentokil Wasp Killer and No Wasps Insecticidal Dust, which both use carbaryl. Follow the safety instructions supplied with the insecticide. A targeted wasp bait is available from Nelson-based company Merchento. The bait, Vespex, was developed in conjunction with DOC, although we do not supply it. To purchase the bait contact Merchento. You will have to pass their online test before purchasing. Vespex can be used on public or private land, but members of the public wishing to carry out wasp control operations on public conservation land need to follow DOC's pesticide permission process. Learn more about Vespex and how to run a wasp control programme.